Disability and addiction have a complex relationship, with both being a cause and effect of the other. Rehab can benefit disabled individuals with addictions. Disability and addiction are a tragically common pair. Persons with disabilities are substantially more likely to suffer from substance use disorders than the general population, and they are also less likely to receive treatment for them. 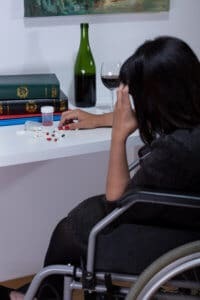 Conversely, persons with addictions are more likely to become disabled, either through accidental injury or through long-term side effects of substance abuse. People with physical disabilities experience substance use disorders at 2 to 4 times the rate of the general population. A disability and lack of support can easily discourage someone’s happiness and sense of purpose in life, creating depressing states. Co-occurring disorders, like depression, anxiety, and unhealed trauma, are especially common among disabled Americans, leading many to seek a false sense of comfort with harmful substances. Individuals with mental and physical disabilities battle unique stressors, such as social perspectives of seeing them as outsiders, an inability to qualify for certain careers, access to certain benefits, and an inability to participate in a number of activities to the extent they would like. Individuals with disabilities are more likely to be unemployed; disabled adults 25 and older are less likely to have completed high school and more likely to live in poverty. They are more likely to be victims of violent crimes and suffer health conditions like obesity and smoking. All of these factors contribute to high rates of substance use seen in the disabled community. According to the Centers for Disease Control and Prevention, 16.1% of adults have difficulties physically functioning, while 39.5 million adults struggle with physical disabilities. Individuals with disabilities often develop substance use disorders to offset emotional and mental disorders, anxiety, low moods, and physical pain accompanying physical disabilities. In the United States, 54 million people experience some form of a disability, of which roughly 9% (a total of 4.7 million adults) have both a substance use disorder and a co-existing disability. Those suffering with intellectual disabilities in particular suffer from staggering rates of addiciton. 7%-26% of individuals with intellectual disabilities have addiction-related issues, depending on the exact condition. These rates are heavily influenced by the effects of some mental conditions combined with the frustrations of dealing with them and the need to cope. Patients with disabilities often use prescription medications to battle painful conditions, many of which have high potential for addiction. Prescription opioids in particular are effective pain relievers, yet are highly addictive and can easily be abused. People with disabilities are more likely to abuse opioids, but less likely to get the treatment they deserve. Opioids are so highly addictive that even individuals that closely follow short-term prescriptions can quickly get hooked, a risk that only goes up the longer the prescription is for. Once a disabled individual develops an addiction to prescription opioids, they will often end up switching over to cheaper and more readily available drugs such as heroin when their prescription runs out. This risk is heightened among the disabled, who are often under greater mobility and financial restrictions than the general population. These factors, combined with the fact that opioid addiction is by far the most likely form of addiction to end in overdose and death, make disability and addiction to opioids a growing cause for concern. 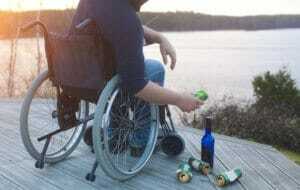 Numbers of individuals with physical disabilities and alcoholism remain high. The combination of emotional and physical frustrations can greatly contribute to lowered moods and a tendency to self-medicate with alcohol. Studies found that up to 50% of individuals with spinal injuries, orthopedic injuries, and traumatic brain injuries indulged in heavy drinking. The ease with which alcohol can be legally obtained greatly contributes to this problem. Individuals with substance use disorders may struggle with underlying disorders they are unaware of. They may have several questions about treatments, medications and disability services. Contact a treatment expert today to inquire of various treatment plans based on your preference. Examine your options for faith-based treatments, holistic-based treatments and peer groups today. Explore the many ways rehab can help you restore your life to one of health and happiness.